You can make meals inside on the three burner range while taking in the view of the lake thanks to the bay window. 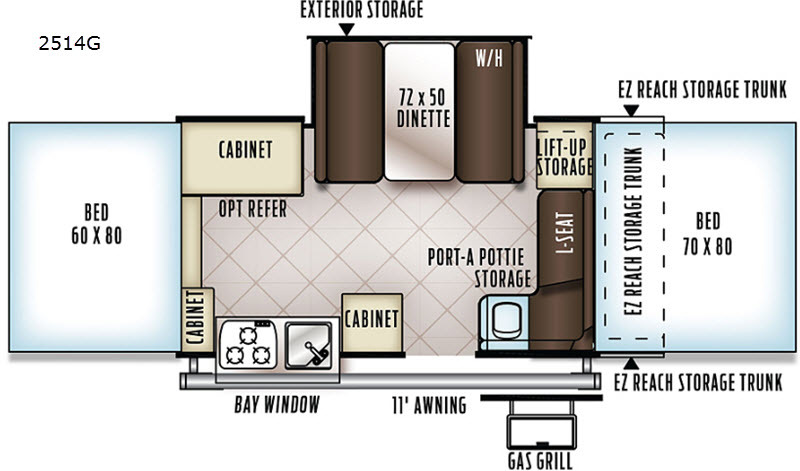 There are cabinets throughout to store your cookware and things, plus there is a convenient port-a-pottie provided in this model. You will also find sleeping space for six to seven people with the king and queen tent end bed, plus on the dinette slide and L-seat. You can probably imagine relaxing under the 11' awning while grilling burgers and visiting with your friends. Book your campsite today! Each Rockwood Premier folding pop-up camper by Forest River offers a power lift system for quick and easy setup at your favorite destinations, and the Easy Glide scissor pole bed supports along with the a five piece sectionalized Vinolon supreme tenting, will give you peace of mind while sleeping. 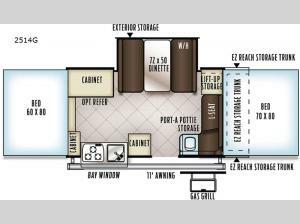 Inside you will find thermostatically controlled heated mattresses, stainless steel-look appliances and sink, and residential style cabinet doors, plus USB charging ports, a WiFi Ranger/WiFi Booster SKY 4, and much more! Choose the layout that fits your lifestyle and start camping with Premier features!